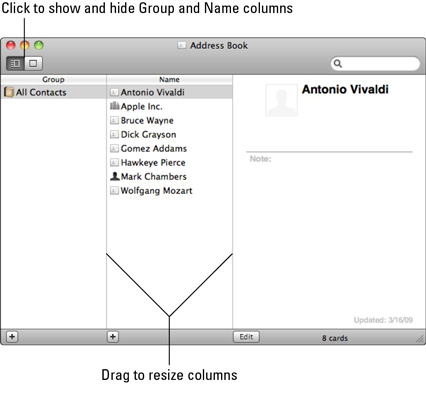 In early versions of Mac OS X, the Address Book appeared only when you asked for it within Mail. 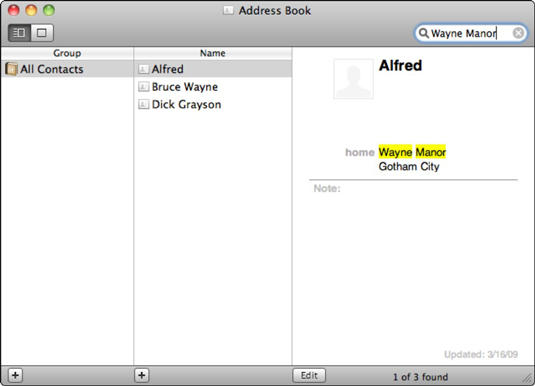 In Snow Leopard, however, the Address Book appears in the Dock and is available whenever you need it. Although the Address Book can still walk through a meadow hand-in-hand with Mail, it also flirts with other Mac OS X applications and can even handle some basic telephony chores all by itself through the use of Services. The following figure illustrates the default face of the Address Book, complete with personal address card: your own contact information, which you enter in the First Use Assistant. Other Mac OS X applications use the data in your card to automatically fill out your personal information in all sorts of documents. The Mac OS X Address Book interfaces with other Mac applications. After you enter contact information in Address Book, what can you actually do with it? To display the card for any contact within Address Book, just click the desired entry in the Name column. You can move to the next and previous cards by using the up- and down-arrow keys on your keyboard. *Copy and paste: You can copy any data from a card (press Command+C) and paste it into another open application (press Command+V). Visit a contact’s home page: Click the contact entry to select it, and click the page link displayed within the card. Safari dutifully displays the home page specified in the entry. Send an e-mail message: Click and drag to select any e-mail address on a card; then click the Address Book menu, click the Services menu, and choose Send To. Bingo! Depending on the information that you select, other services might also be available. Add an iChat buddy: From within iChat, click the Buddies menu and then click Add a Buddy. From the dialog that appears, you can select a contact card that has an Instant Messenger address and add it to your Buddy List. Export contacts: From within the Address Book, select the contacts that you want to export, click File, and then choose Export vCards from the Export pop-up menu. Address Book displays a Save sheet. Navigate to where you want to save the cards and click Save. Search among your contacts: If you’re searching for a specific person and all you have is a phone number or a fragment of an address, click in the Search field at the top right of the Address Book window and type the text. While you continue to enter characters, Address Book shows you how many contacts contain matching characters and displays just those entries in the Name column. Speaking of searching in the Address Book, Spotlight is also at your beck and call; click a contact to select it, and then click the Edit menu and choose Spotlight. Snow Leopard searches your entire system for everything related to that contact and displays it in the familiar Spotlight window.